It's been in development for about six years and lately there has been no news on the project. Many have abandoned all hope and various internet sites have declaired the project dead or inactive. It is the most ambicious Famicom / NES project in history and people are wondering what happend to this great title. I have the answers, or at least some information that eager gamers might find interesting. Before I lay the new information on you, let's take a quick look at what's been said and done so far. The author of the Grand Theftendo project, Brian Provinciano, has revealed quite a bit about his work, the overall concept of the game and provided us with some "making of" type of information. What we know today is that the game will run on the standard Famicom / NES hardware [if you can flash it onto your own cart, since the title will be released as a free of charge ROM image] or emulator. Grand Theftendo is based on Grand Theft Auto III and the story plays out in the city of Portland. 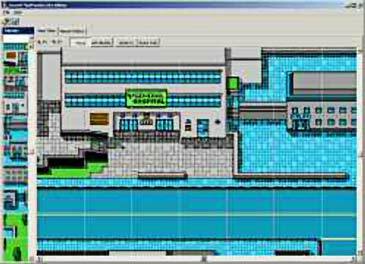 The game map is quite large, unlike anything that's been previously done on the 8Bit Nintendo platform. The map is 7168x4672 pixels in size. This corresponds to 30x24 game screens, and can be walked or driven though without any load times. This beats any previous NES game hands down not only in size but also in the amount of detail. All this was possible thanks to Brian Provinciano's careful planning and skill. Being a one man show, Brian has created a full set of tools to aid him on his quest. He created the NESHLA [Nintendo Entertainment System High Level Assembler] and various editing programs that include map editor, road editor, dialogue editor, item placement tool, graphic converters and other applications that made the development easier. 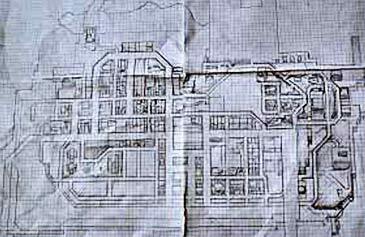 He even drew the whole city map on graph paper to get a better feel for what the map should look and play like. The amount of work that was put into this game says it all. A project like that takes time and skill to complete. While Brian Provinciano pbviously has the skill, time will always be a problem. After all most homebrew developers have regular jobs and families to take care of. Things have been too quiet lately so I have decided to contact Brian and ask him about the game. I asked him about how things were progressing and if they were progressing at all. This is what he had to say: "Over the years it's been on hiatus off and on due to work, but it's under steady development now, has been again for about 9 months.". So there you have it. It's confirmed and it's still in the works. Brian is a full time game developer and I can understand the problems he is facing. After all, nobody likes sitting in front of a computer 24/7 doing the same thing. When you come home from work last thing you feel like doing is more work. I wish Brian all the best and hope that the finishing result will be worth all the work and all the wait. Good luck! 2008.05.17 Sat ★ Unsorted ★ Comment Tweet This!